The Elderhostel program is the perfect way to travel and learn about new places for those of us over 55. The traveling grannies are in this category, and several years ago we decided to try out this new experience. The programs in the U.S. typically run five to six days and besides comfortable accommodations and good meals, classes on a variety of subjects are offered; there are no exams, grades, or homework, the only motivation being your desire to learn. 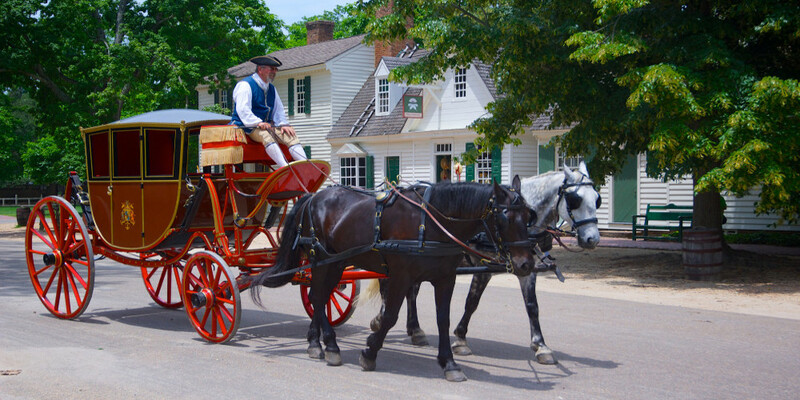 There are several programs to choose from in each state, and we chose one in Williamsburg, Virginia. The cost of all of this from Sunday to Friday was just under $500, the only extra cost being our transportation to Williamsburg. The six of us, Sally Lion, Marge Swanson, Margie Eames, Jackie Eames, Betty Ann Russell, and I, met at Sally’s house in northern Virginia and drove from there in two cars to Williamsburg, about a two to three-hour drive. After stopping for lunch in Fredericksburg, we arrived at the Ramada Inn just outside of colonial Williamsburg a little after 5:00 p.m. We signed in, received our name tags and were assigned a motel room. Sally and I were rooming together, so we left our suitcases in our room and met the others in the main dining room, where we were provided with a delicious buffet dinner. After dinner we heard a very interesting talk about the history of Williamsburg. It was settled in 1633 and was designated the capital of colonial Virginia in 1699. After going through a decline in the late 1700’s, restoration of more than 200 buildings was begun in 1927 and today we experience this charming town just as it was in the 18th century. The College of William and Mary, which was founded in 1693, and is one of the country’s oldest colleges, is also here in Williamsburg. During this particular week, there were two sets of classes being offered. Four of us grannies, including me, had signed up for (1) the family in England and America in 1500-1800, (2) America’s sects, cults, and small denominations, and (3) a social history of colonial medicine. The other two grannies had chosen classes relating to Halloween: (1) Williamsburg’s ghosts, (2) Edgar Allen Poe stories, and (3) our spiritual world. The two groups met separately that first evening to introduce ourselves and to learn more about the upcoming classes. It had been a long day, and we all slept well that night. Breakfast was served the next morning in a restaurant next to the motel, Martha’s Plantation, where we were offered cereal, juice, fruit, eggs, bacon, sausage, French toast, and coffee. Our first class was taught Monday morning after breakfast by Mrs. Catherine Kerrison, a professor from William and Mary. How interesting it was to learn about family life 200 to 400 years ago! How different from today’s families! This was in the Ramada Inn’s Mt. Vernon Room where all of our classes that week were to be held. After a short break, we heard David L. Holmes, Jr., Professor of Religion, tell us about the various religious sects and denominations in America; this was equally interesting. Lunch was served that day in Ramada Inn’s dining room, and we were offered soup, salad bar, fruit, macaroni and beef, a vegetable, rolls, cookies, and beverage. In the afternoon our class was bussed to the College of William and Mary, which was, we were told, named after England’s King William and Queen Mary. When we visited the Christopher Wren Building, the college’s oldest, we were treated to a dramatization in one of the old classrooms, Two gentlemen were dressed in the clothing of the 1700’s, one being an itinerant (or traveling) preacher and the other an agent for the colonial government. The preacher was trying to convince the government’s agent of the benefits of anew religious viewpoint he’d heard from John Wesley, but it was obvious the government’s agent had his doubts. John Wesley was the founder of today’s Methodist Church. We then caught a bus back to the Ramada Inn for dinner, which included our choice of chicken or fish, vegetables, rolls, salad bar, and desserts. All of our meals that week were similar to today’s and all were delicious. The Elderhostel catalog had described the meals as modest, but we all agreed they were far better than modest. The next morning we learned more about early family life from Mrs. Kerrison; Dr. W. B. Jones, a medical doctor and professor, then talked to us about the doctors and medical treatment on those early times. After lunch we drove to a very lovely plantation on the James River called Carters Grove. It was a large beautiful home facing the river and adjacent to it were the renovated slave quarters. After dinner that evening we were treated to a fascinating talk by Mr. L. B. Taylor who’d written several books about the ghosts of Williamsburg, stories he’d heard over the years from various people about their experiences. I bought one of his books, which I enjoyed after I returned home. All of us grannies celebrated our birthdays that evening in Margie and Jackie’s room with wine and cheese and by exchanging presents. This was something we now did every year when we saw each other. We decided to have our lunch the next day in a colonial Williamsburg restaurant and then spend some free time strolling through town. Chownings Tavern was a reconstruction of an early English tavern of 1766. The six of us sat outside in the rear of the restaurant under a grape arbor, very pretty and picturesque. I loved my lunch of shepherd’s (lamb) pie and savory home-made vanilla ice cream. One of the restored buildings we visited that afternoon was a courthouse where we observed cases being brought before a judge. A woman was complaining that the meat she’d bought was bad because it was covered with flies and her husband wouldn’t eat it. The judge dismissed the case after pointing out that if she’d purchased the meat in the morning instead of the afternoon, she wouldn’t have had that problem. In the evening we attended a concert where a very talented musician played unusual instruments from the 1700’s. One of them was a very small fiddle which a gentleman would carry in his pocket and play it as he rode along on his horse. It was now Friday and the last day of our Elderhostel. We all agreed that we’d had a terrific time as the classes were interesting and stimulating, the price was reasonable, and it was a good way for us to be together. It was enthusiastically suggested that we do this again some day. After finishing up the morning classes and haing our lunch, we packed up and were on our way to northern Virginia where Sally and Marge lived. After having completed a close-up and hands-on experience of life in the 1700’s, I was much more aware of how much our daily lives differ from those long-ago times. The week in Williamsburg was a true learning experience and one which I won’t soon forget. we all, however, had missed Lyn Little of Pennsylvania being with us, but she’d earlier booked a Panama Canal cruise and couldn’t join us this time. Margie and Jackie flew back to northern California Saturday morning, while Betty Ann and I left for home on Monday, Betty Ann to Florida, and me to Riverside.